When traders or importers around the globe need an advanced B2B Automotive parts trader, they trust the tools and digital solutions that Genuine Autoparts LTD has developed. They provide customers with the highest quality, most up-to-date and competitively priced premium and volume automotive parts through the import and export of IAM, OEM, and OES passenger car, truck, bus, van, EVs, SUV, forklift, industrial parts and tires. Genuine Autoparts is an innovator in the automotive industry, and sustainability is a critical part of their DNA. According to Alexandra Dyankova, “we understand that respecting and preserving our environment is a responsible task we must undertake without delay or waiting for others to lead the way.” Being green certified by Green Business Bureau provides them with the necessary education and comprehensive content and initiative ideas for implementing best practices in sustainability. The GBB certification is a natural extension of the established greening practices already in use at Genuine’s facilities located in Sofia, Bulgaria. The three main areas of focus for the Genuine Autoparts sustainability strategy are energy and waste reduction; recycling; and eco-procurement. Energy saving practices, while seeming simple and obvious, can result in dramatic savings for any organization. As a rule at Genuine facilities, lights are switched off when not needed, PC stations are shut down daily, and printers are set to Sleep mode. They use rechargeable batteries, and during warmer month, they utilize solar light and have started integrating sun-cell powered lights. Their HQ building has large double glass see-through windows, which was a key design decision during the building process, that saves light usage for both the warehouse and the offices throughout the day. With a growing multinational team, it was challenging to organize the company to work in a successful, yet organized and sustainable manner, so they introduced remote working as an option for some of their employees living outside of the corporate locations in Bulgaria. The use of new technologies and an advanced digital strategy has led to many benefits for the employees, Genuine Autoparts, and the environment. “Building a virtual office is very important to us. We are using video-conferencing, web-conferencing, Skype and phone. We cluster meetings to reduce schedules and limit travel to a minimum. Our car-pooling policies have also benefited our employees,” said Alexandra. Furthermore, by digitizing their work, Genuine Autoparts has implemented a paperless and cloud-based office strategy where in some cases as much as 90% of business communication, documentation and archives are stored in a cloud. If printing on paper is necessary, they use only 100% recycled paper, print in black and white, and double sided for quantity reduction, and reuse single sided prints for use as internal documents or as note paper. Food and water is also very important to the company, so at their Sofia location, they have a canteen which produces only fresh home-cooked, organic food with less meat, while also offering sustainable fish menus. They provide washable utensils for continuous use, and they use personal coffee cups instead of plastic throughout their locations. This strategy also translates to their marketing and trade show events where they prefer to use sustainable materials in order to reduce waste. Recycling plays a huge role in Genuine’s daily operations as they are recycling paper collected from office shredders, plastic that wraps and covers received goods, along with leftover packing materials, cardboard, and plastic. Used batteries and empty toner cartridges are all recycled and disposed of properly. Repurposing is the next level of sustainability for the company where they now reuse incoming wooden and plastic pallets, boxes, and cardboard packaging. The excess quantities are sold to be reused. Besides their green procurement strategy that focuses on purchasing products and services that cause minimal impact on the environment, Genuine Autoparts goal for 2019 is to intensively implement a Green Procurement List for biodegradable and recycled products designed to reduce energy, such as recycled paper and notebooks, recycled pens and pencils, LED light bulbs, recycled toner cartridges, rechargeable batteries, and many office materials. 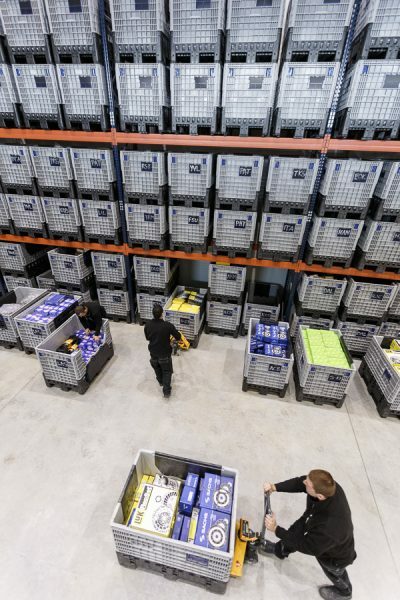 As an example of one of their procurement successes in 2018, Genuine Autoparts was able to replace a diesel powered forklift with an electric alternative, which reduced fuel consumption, harmful noise and gases emitted in the warehouse, and made the working environment friendlier for all employees. And as a natural follow on to green procurement, they aim to support environmental organizations as a part of their social responsibility contribution, supporting more than 20 national and international NGOs. For more information about the sustainable automotive solutions provided by Genuine Autoparts LTD please visit them at www.genuineautoparts.bg.